From page one this amazing historical YA offers everything to the reader. From the paranormal aspect of time traveling to the 1850’s and the world of slavery, this plot offers something for everyone - teen and adult. There is an organization called the JMP History Mystery Detective Agency made up of Jinx - a great girl who has a very important gift; her best friend, Max, who has the gift as well but is still learning all the ins-and-outs of time travel; a dog named Petey, and a cat named Poppy, whose thoughts can be heard by the teenagers. Together, this quartet has the ability to be ‘called’ back in time to solve mysteries of all kinds. In this first novel of the series Jinx has a dream, a frightening dream about two boys who are sold by their “Master” in order to settle a gambling debt he owes. The boys will be taken away from their beloved father, down to the Deep South, where they will work as house slaves in Georgia. The father and uncle of the boys are beyond hurt and frightened, yet determined to do whatever they can to get these boys back. Enter…Jinx. On her Aunt Merry’s farm in Pennsylvania, Jinx and Max are on a vacation of sorts. They are sitting out in the field under the starlight with their dog and cat, listening to the crickets. There is, however, one sound that shouldn’t be heard - a train whistle in the distance. A whistle that calls out to them for help. 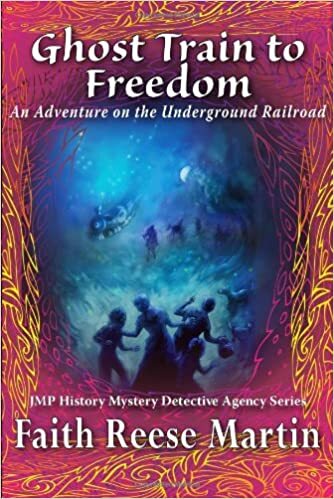 When Jinx and Max travel back in time, they find themselves still on Aunt Merry’s farm - but in the 1850’s when it was owned by a nice married couple named John and Mary, and was a stop on the Underground Railroad. Jinx and Max meet up with the father and uncle on the run from Jinx’s vision, and they promise to do whatever they can to rescue the boys who were sent away. As their adventure continues, they run into some amazing characters from history, and follow the ‘ghost train’ backwards in order to head into the Deep South. Using a quilt, a vision and each other - Max and Jinx find themselves on the ultimate adventure that involves famous people who helped others gain their freedom at all costs, including the amazing Ellen Craft, who actually disguised herself as an invalid white man traveling with her servant in order to gain freedom for herself and her husband. From the slave ships that sold men, women and children like cattle to the ultimate fighters who sacrificed a great deal and lost their lives in the fight for freedom - this author has not missed a thing. Not only is this story exciting, and a true lesson in how faith and beauty can come from the depths of sadness and inequality, but the book also adds maps, historical backgrounds, and a beautiful quilt with explanations and pictures that truly tells the tale of slavery, and the hardships humans had to go through in order to get what was rightfully theirs. Another fantastic fact? There will be more JMP adventures to come! Quill says: A great YA that hopefully will grow a large audience. All children (and adults) should follow Jinx and Max on their truly amazing adventure.